Anaplastic astrocytoma is a rare type of malignant brain tumor classified under WHO grade III in pathological classification system for tumors. Astrocytomas are tumors that develop from certain star-shaped brain cells called astrocytes which are present in human brain. Astrocytes along with other similar cells are involved in forming tissues that surrounds and protects other nerve cells found within the brain and spinal cord system which are collectively called glial cells and tissues formed by them is known as glial tissue. According to world health organization these astrocytoma tumors are classified into I to IV grades based on how fast the cells are reproducing and that likelihood that they will spread (infiltrate) nearby tissue. The signs and symptoms of these anaplastic astrocytoma vary depending upon the location and size of the tumor but most symptoms result from increased pressure within the brain. Other symptoms of these tumors include severe headache, focal neurological deficits, depression and sometimes seizures. Global increase in the reported instances of anaplastic astrocytoma is driving the demand and huge investment by major drug manufacturers in R&D activities to develop new molecules to cure this rare brain tumors. 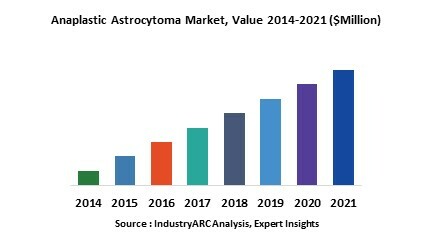 Globally North America contributed the highest revenues in anaplastic astrocytoma market due to deep reach of the treatments to the large number of population followed by Europe and Asia-Pacific regions as the second and third largest markets for Anaplastic astrocytoma.